On Jan. 26, 2014 I received the sad news through my teacher Andy Weber that his tibetan thangka teacher, the Master Thangka Painter Thargey-la, has passed away… He must have reached the age of about 85. Fortunately his passing was very smooth and peaceful (as he was during his life). have been in touch with this beautiful tradition and I would not have been able to pass it on. 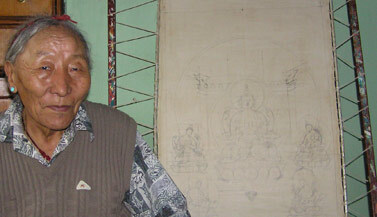 So my thangka lineage is hundreds of years old. The picture on the left (taken by photographer Maciej Wojtkowiak in 2001) shows Thargey-la with a gorgeous and large thangka of Padmasambhava (Tibetan: Guru Rinpoche), together with his 2 consorts Mandarava and Yeshe Tsogyal. The pictures on the right show Thargey-la (together with me), and were taken when I visited him in his house in Boudhanath, Nepal, in 2006. I wanted to see where may lineage came from. Thargey was a very humble man, and I was so happy to meet him and be able to pay my respect. At the time I met him, unfortunately he couldn’t paint anymore, as he ‘suffered from old age’ as the term in the Buddhist philosophy is called. In gratitude I think of him and the enormous amount of beautiful mural paintings and thangkas and that he has left and can be viewed in the many monasteries in and around Boudhanath. The Buddhas from his hand have already inspired many people and I’m sure will continue to inspire many beings on their own spiritual path. I feel honoured to be part of this thangka lineage and with my art and courses I hope to serve as an inspiration to others, just like him. More pictures of Thargey-la I will put in the newsletter that I’ll send out to my students around the world about his death.